“Last night, South Carolina lost an inspirational leader and eight parishioners who were gathered in their house of worship. And I lost a dear friend,” SCDP Chair Jaime Harrison said. “We should also remember the mission of Mother Emanuel. For two centuries Mother Emanuel has served as a force for change through the power of love. Mother Emanuel’s resiliency should serve as an example to us all. Senator Pinckney and his wife, Jennifer, have two children, Eliana and Malana. They live in Ridgeland, South Carolina. The couple married in October 1999 after meeting while Senator Pinckney was a student at Allen University and Mrs. Pinckney was attending the University of South Carolina. 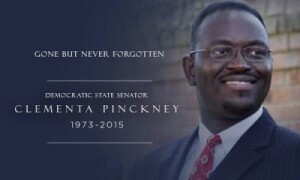 Senator Pinckney was a Page in the State House and, in 1996, at the age of the 23, he began serving in South Carolina’s legislature at a state representative. At the time, he was the youngest African American ever elected to the legislature. He was then elected to the State Senate in 2000. A Beaufort, South Carolina native, Senator Pinckney graduated from Allen University in 1995, was a Princeton University Research Fellow in 1994, earned his Master’s of Public Administration from the University of South Carolina in 1999 and studied at the Lutheran Theological Southern Seminary. Pastor Pinckney began preaching at the age of 13, and was first appointed to pastor at 18. He was named pastor at the Mother Emanuel AME Church in Charleston in 2010. Pinckney and other South Carolina pastors held rallies after the shooting of Walter Scott. He also played a key role in pushing for body camera legislation, co-sponsoring a bill that was recently signed into law by the governor. Columbia, SC – On September 22nd, the South Carolina Democratic Party will begin the implementation of the national convention Delegate Selection Plan. The goal is to ensure the South Carolina Delegation to the National Convention reflects the diversity of South Carolina Democrats for the Executive Committee and the Delegate Selection Plan Affirmative Action Committee. The training will be held following the SCDP Executive Committee meeting, at 7:00 pm at the Lourie Center at 1640 Park Circle, Columbia, SC. The South Carolina Democratic Party Executive Committee formally ratified the 2016 Delegate Selection Plan at the meeting on June 11, 2015 and the Plan was approved by the Democratic National Committee Rules and Bylaws Committee on June 26th. This plan outlines the process to be used by the Democratic Party of South Carolina in selecting delegates for the National Convention, scheduled to take place in Philadelphia on July 25–28, 2016. The Democratic Party of South Carolina will host the FIRST IN THE SOUTH Presidential Preference Primary to be held on February 27, 2016. Voting in the Primary is the first step in the process to be elected as a national delegate. Counties will hold precinct meetings in early March and the County conventions will be held during the period March 19-March 28, 2016 to elect delegates and alternates to the State Convention on April 30, 2016 in Columbia. The national delegates for congressional and at-large delegates and alternates will be chosen at the State Convention. South Carolina is allotted a total of 59 delegates and 4 alternates to the National Convention, including six delegates who are already determined by their positions. The Delegate Selection Plan and a summary of the plan, including a step-by-step guide on becoming a delegate, is available on the SCDP website at http://scdp.org/wp-content/uploads/2015/07/SCDP-Delegate-Selection-Plan-7.13.15.pdf. A Spanish version of the Summary will also be available soon. Columbia, SC -South Carolina Democratic Party Chair Jaime Harrison issued the following statement following Secretary Hillary Clinton’s remarks today on restoring the Voting Rights Act. “The right to vote is a fundamental part of our democracy and the South Carolina Democratic Party commends Secretary Clinton for her speech today on voting rights. Clinton’s call for swift action to restore the Voting Rights Act is exactly what South Carolina and the United States have a fundamental right to expect. National standards such as a minimum of 20 days of early voting and making voting available on the weekends will inevitably lead to higher turnout and greater participation by Americans in our electoral process. “The SC Democratic Party and the nation express our deepest condolences to Vice President Biden, Dr. Jill Biden, Hallie Biden and the entire Biden family. Beau was a shining star and we will miss him.